This one’s all over the map. It was recorded at the same time as HORSEMOUTH (& OTHER BEDTIME STORIES), and all the period-correct sound issues are present and accounted for (muddy acoustic guitars, bottom-heavy mixes, and some speaker-blowing screams). 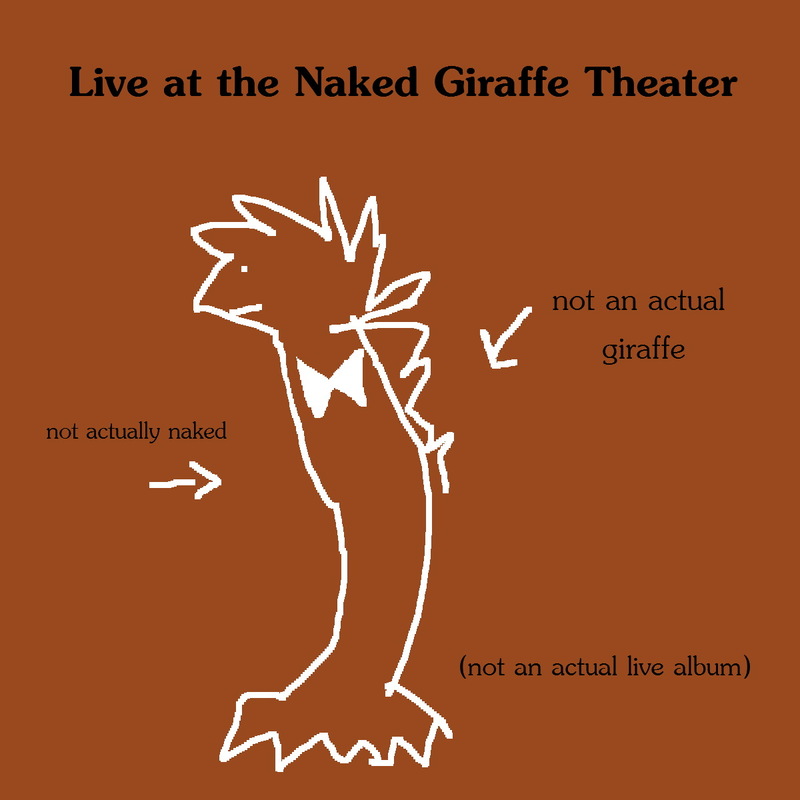 The idea was to make a mock-live album, with me improvising a bunch of new songs in front of an imaginary audience, the size of which would depend on how many extra tracks I had leftover in any given song to overdub my own fake audience noise. I must have lost interest in that idea pretty quick, because it’s an approach that only survives on the very first song — Patricia, a love song for a baloney sandwich. The “audience” mutters about how they’ve read about me and I’m supposed to be some kind of talentless weirdo, but by the end of the song I’ve won them over with the depth of my ridiculous emoting. Hypocrite Shoulders dusts off one of the most overused chord progressions of all time and tries to inject it with some weirdness. I’ve always found it funny how the lead vocal is sung in a silly voice while the harmonies play it straight. Makes for some fun juxtaposition. A Song for Brynn was written for a girl I went to high school with. She asked me to write her a song, and I did. I decided to have some fun with it and called in Bob Dylan, Neil Young, Bill Clinton, and the ghost of Elvis Presley (or my best attempts at impersonating them) as guest vocalists, making for some pretty weird harmonic interplay. The ghost of Elvis has a nice bit at the end when he sings part of “An American Trilogy” a cappella. That song always got me going. Brynn seemed to be pretty happy with it. She told me she forced everyone she knew to listen to it. Not that it led to any mutual rollerblading while eating cotton candy, but hey, you can’t win ’em all. Thirteen Lesbian Kangaroos is some kind of quasi-classical/opera noodling, containing elements of “La Cucaracha”, while Soap Head is just stupid enough to save itself, with intentionally moronic lyrics and a moronic vocal delivery to match. The wailing at the beginning was from a different song I recorded earlier the same day that didn’t turn out. All I remember about it now is that I was playing piano and the lyrics had something to do with school. The only bit of it I retained was that two-second vocal moment, recording over the rest, and somehow it fit, even though the new music had nothing to do with what was there before. The end result is almost like my crude take on modern country music, with an IQ in the low double digits. 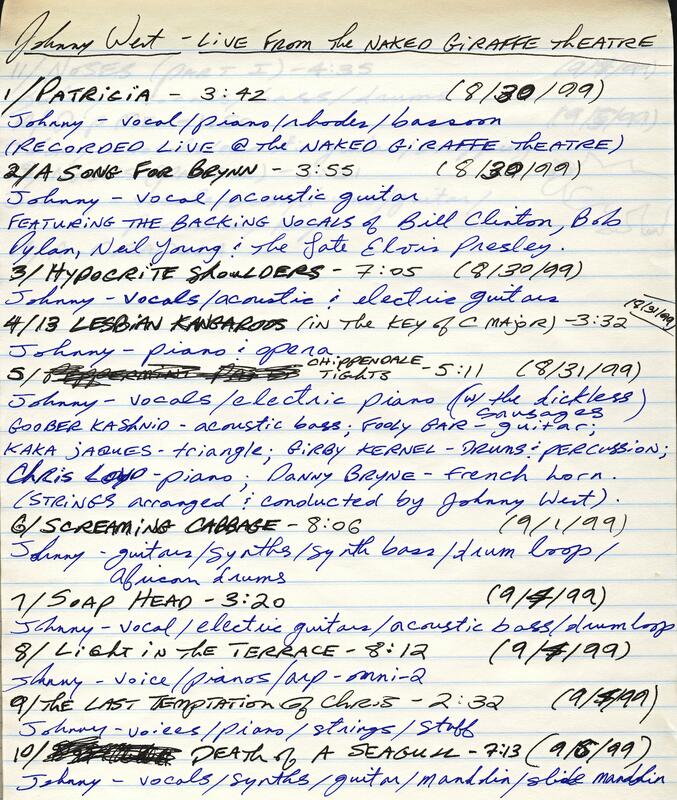 Elsewhere there’s goofy poetry (The Last Temptation of Chris), another pretty neat early stab at quasi-electronica (Screaming Cabbage), a two-part song in which noses are people too (Noses parts 1 and 2), and the half-instrumental piano experiment Light in the Terrace. That last one has become one of my favourite songs on the CD over the years. It’s rough — you can hear me stop recording at least four times because I have no idea where I want to take the song, only to decide I like what I was just doing enough to resume recording and develop the idea some more — but it’s got a certain something about it. The last three minutes or so are a blatant John Cale homage, though my lyrics aren’t really influenced by anything (“There was a little African goat trying to unravel himself, for he’d been caught in bubblegum for seventeen years,” goes my favourite bit). The Arp Omni-2 synth makes its final appearance on a solo CD of mine for many years right at the end, sounding pretty nifty as it burbles away for a few seconds. Why did I neglect such a cool instrument for so long? No one knows for sure. It wouldn’t be until AN ABSENCE OF SWAY, ten years down the road, when I dusted it off again and realized just how much I’d missed it. The highest high point for me on an album that’s pretty random all the way through will always be A-Crapola. It starts off as some street corner a cappella weirdness and evolves into something of a mini-play starring Bill Clinton and Charles Manson. Lo-fi as it is, its insanity cannot be denied. There’s also the hidden track, wherein Charles Manson returns to ask me for an autograph and I kill him with the power of my mind. Good times.